Summary: Warming up. Dry first part of the week, but the end of the work week will be wet. Easter Weekend looks pleasant and dry. We are drying out this morning from overnight rains. Our high today will be warmer than it has been at about 66 degrees. Partly cloudy skies will be present as winds come out of the NNW at about 5 mph. No chance of rain. Overnight low tonight will be 40 degrees. Tuesday will be gorgeous! High 75 degrees with no clouds. Winds will be coming out of the WSW a little more breezy than Monday at about 10 mph. The low overnight will fall to about 46 degrees. Wednesday will be very similar to Tuesday. High around 77 degrees and no clouds. There is a tiny chance of rain – 20% – likely around dusk or dark. Overnight low will fall to about 58 degrees. Update 10:50am: We are waking up to discover significant changes in the forecasts for Tuesday and Wednesday this week. 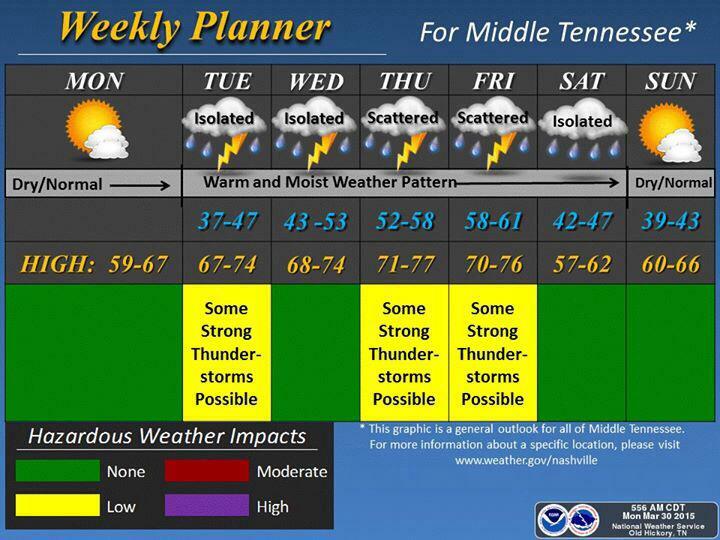 NWSNashville has added thunderstorms to the forecast every day this week starting Tuesday. They believe we could see strong thunderstorms on Tuesday, Thursday, and Friday of this week. This entire week, however, they don’t expect things to be severe, as that should stay west of us this week. For Tuesday and Wednesday, a warm front will be moving northward through our area, bringing with it warm, moist air and enough instability to create a few isolated thunderstorms. 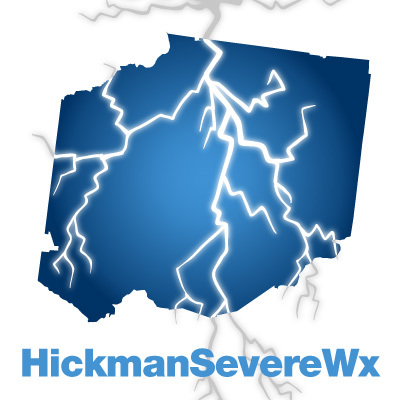 The Storm Prediction Center has Hickman County on the edge of a marginal thunderstorm category for Tuesday. The Storm Prediction Center also currently doesn’t have us outlooked for thunderstorms on Wednesday, but this could change. Below shows their convection (storm) outlook for Wednesday – where the severe weather is staying well west of us. Thursday/Friday: Our next rain maker will make a mess out of the end of the work week. Thursday and Friday are going to be wet, thanks to a cold front moving closer and through Middle Tennessee. Scattered rain showers move in during the overnight hours on Thursday morning and becomes more widespread as the day goes on. Winds will be breezy out of the SSW at about 10-20 mph. Chance of rain Thursday morning will be about 40% while increasing to an almost guaranteed rain chance at 90% in the afternoon and evening hours. It doesn’t appear that this will be severe, but it is also too many days in advance to make that determination. Thursday’s high temperature will reach the 78 degree mark. Overnight low won’t fall much – only to about 68 degrees. Thursday nights’ thunderstorms will carry over into Friday morning with a 90% chance of rain. Rain then starts to taper off Friday afternoon and evening to about a 4 in 10 chance of thunderstorms. The cold front pushes through on Friday, holding high temps to about 66 degrees. Friday night/Saturday morning will see a low temp of 42 degrees. AS FOR ANY STRONG OR SEVERE POTENTIAL…WE ARE NOT CURRENTLY OUTLOOKED. HOWEVER…THURSDAY AFTERNOON AND ESPECIALLY ON FRIDAY AFTERNOON…WE COULD SEE SOME STRONG THUNDERSTORMS WITH THE SOUTHWARD MOVING FRONT. They have requested spotters keep an eye out on the weather, even though they do not anticipate severe weather. Trained spotters are encouraged to call in anything that meets reporting criteria. We also encourage reports using Twitter and the #tspotter hashtag. Saturday/Sunday: Outdoor Easter plans look to be safe and pleasant. It doesn’t appear that rain will spoil any outdoor Easter plans on either Saturday or Sunday. Temps will be a bit cool, but tolerable for Easter egg hunts. 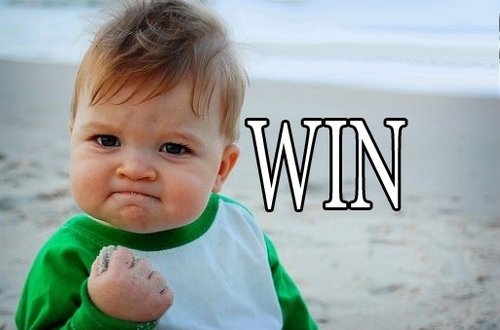 62 degree high for Saturday and 66 degree high on Sunday. Both days look at a 10% chance of rain. Let’s hope this doesn’t change so that we can have a great holiday weekend! Update 10:50am: The NWSNashville has put in a slight rain chance for Saturday, although it appears to be isolated.